Upon entering B. Wurtz’s This Has No Name at the ICALA, you can’t help but grin as single-use castaway objects are given a second life. Paper bags, plastic container lids, old socks, and abandoned miscellanea are resurrected into wall hangings and sculptural assemblages, proud to have a new life in a distinguished gallery setting. As you walk through the multiple rooms, you’re taken aback because this art is accessible. It’s doesn’t cry sophistication and an expensive education from a prestigious art school. It subverts the hoity-toity bourgeois nature of other artworks in blue-chip galleries scattered across Los Angeles. Donned on one of the walls are photographs of knick-knacks that declare their place in this world. At a cursory glance, Untitled (British Design), is an austere black-and-white photograph that presents the subject in an upward, reverent style, similar to how one would photograph a historically precious building. Below the photograph, is a humble household item— the cheese grater, sitting on a modest wooden platform, appearing to beam at its effigy. Other objects in this series are similarly transformed into these idols that demand importance and dignity likened to a new building erected by an architect. At times, it feels as if the objects are personified with an imposter syndrome, whispering to each onlooker as if to say that they have a secret and do not belong here. However, once propelled into this new light, these sculptures have no intention of returning back into the forgotten drawer in one’s home. Untitled (bread quilt), 2012. Courtesy of officebaroque. In some of his less baroque works, Wurtz experiments with combining text and image. 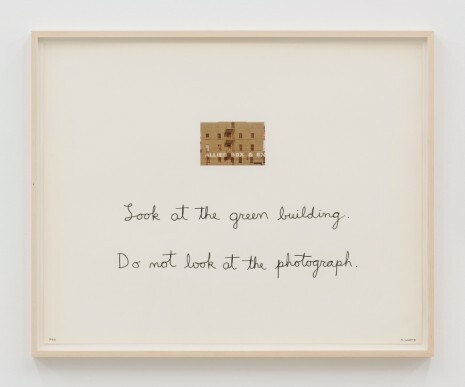 Drawing from prevailing successful works at this time and influenced by his good friend, Baldessari, his more overtly political works, such as Untitled, 1980 features a blank canvas with a photo of a green building, with text underneath which reads, “Look at the green building, do not look at the photograph.” This piece forces the viewer to confront the physical object they are looking at. 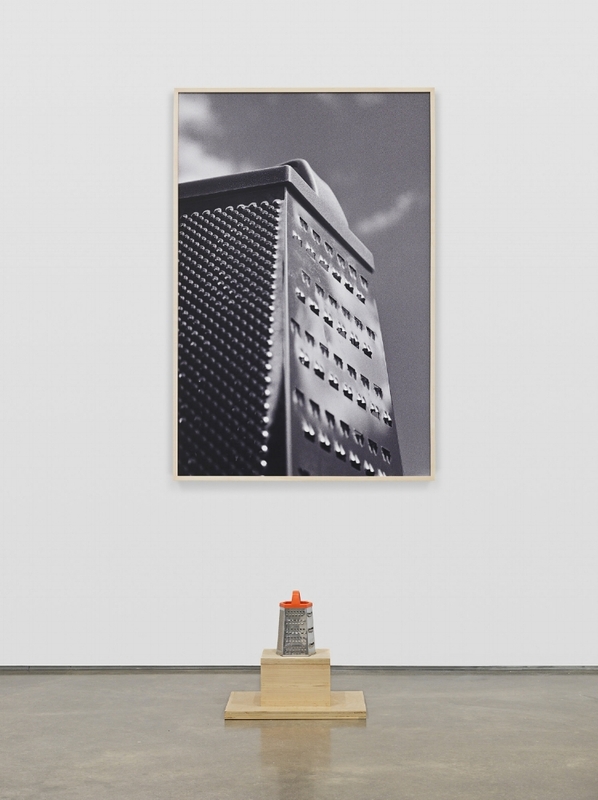 Much like Magritte’s The Treachery of Images, Wurtz demands that we see the piece for what it is, a canvas with text, paralleling the photograph of the green building. This self-referential piece makes an implicit gesture that demonstrates how art can be used to make a statement. Untitled, 1980. Courtesy of dailyartfair. At the crux of this exhibition, Wurtz critiques the consumption of mankind, not only in our everyday eating habits, but also the way in which goods are produced and purchased. Man-made objects are created for convenience only to be discarded once they have completed their purpose. People behave like gods and create these lives to store our zero-calorie, low-fat greek yogurt only to have them buried in a hole in the ground as soon as the expiration date nears. In his brief talk, Wurtz describes a life of living minimally stemming from necessity and default as an artist. He provokes the question of why this isn’t the standard for our culture. At the heart of his work, you see an artist playing with objects in the same way a child would— with an exploratory nature and an open mind. Wurtz subverts the idea that an object has one intended purpose. Each piece has its own personality and gusto which demands that you think again before casting it away into a misfit landfill. Bringing a new perspective to environmental art and ready-mades, Wurtz asks the viewer to shift away from mindless consumption towards mindful reclamation.